Clamp lamps take two relatively basic inventions and blend them together to create a single unique product. 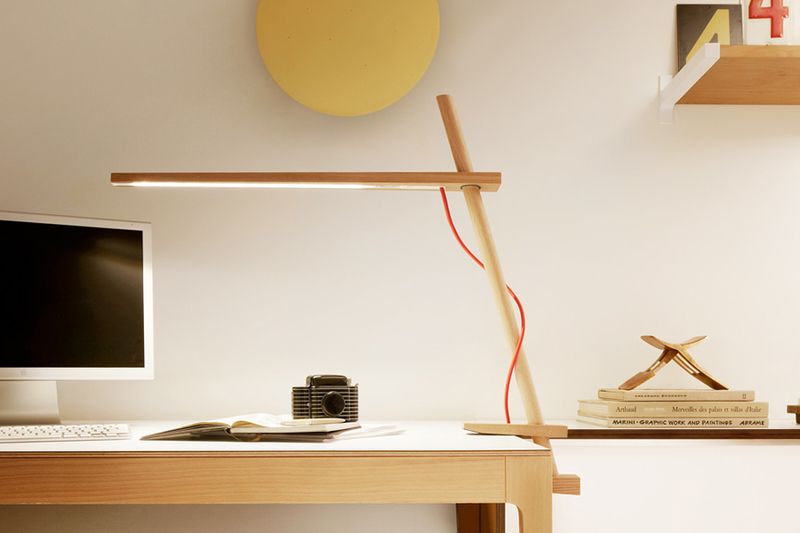 At one end is the clamp, designed for attachment to a desk, tabletop, or other piece of furniture and at the other is the lamp, which illuminates an area or room as lamps are designed to do. Clamp lamps serve a variety of purposes. The fact that they can clamp onto just about any sturdy object means you’re left with more room on the desk or table where you would have placed a regular lamp. Clamp lamps also typically feature flexible necks that allow for them to be positioned in a variety of ways, meaning you designate where the light shines. Clamp lamps may be cord operated and plugged into the wall like regular lamps, have USB attachment options, or accept batteries and allow for portable use. 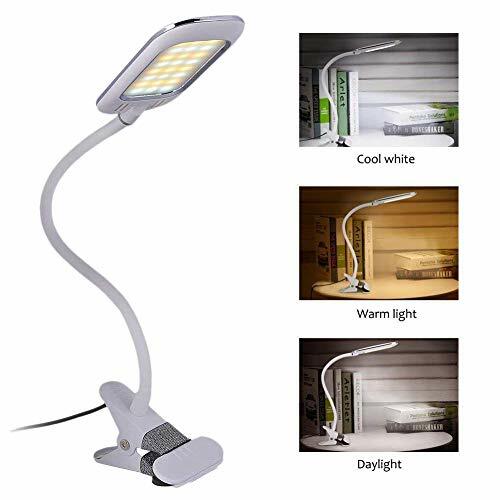 This simple 14.6 inch Super Bright LED Clip-on Lamp from Home Design is great for dorm rooms, crowded apartments, and anywhere else a space-saving and energy efficient light is needed to help get work done. The lamp plugs into the wall via the attached 5-foot AC power cord and has a simple on/off switch on the head of the lamp. The 360° flexible gooseneck allows you to easily adjust the light to perfect angles as needed. The lamp uses a single, super bright LED light bulb that is included with the lamp and uses a mere 5-watts of power when on. The heavy duty 14.6 inch gooseneck adjusts to fit in small spaces and illuminated work and reading areas with minimal space consumption. The clamp can affix to any surface 1.5-inches or less in width, making it ideal for students, office workers, and those who work from home. Overall, the Home Design LED Clip-on Lamp is well-made, versatile, and plenty bright enough for a variety of working needs. 3 lighting modes for you to choose: warm light, white light, and cool light and 10 brightness levels you can adjust: dim and bright. The Daffodil USB Light is the perfect companion to anyone who spends long hours working at the computer, whether at a desk in an office or on the go. 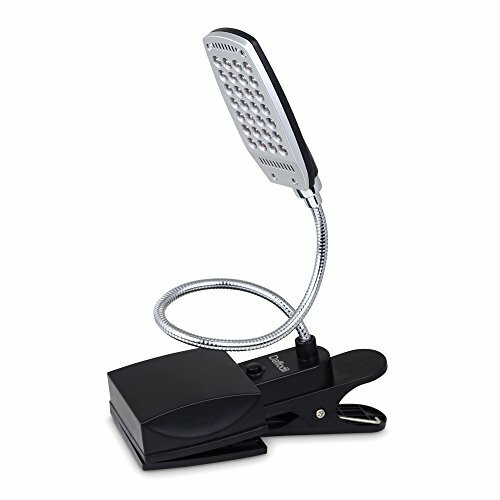 The light has a detachable cord that plugs directly into the USB port of your PC or Mac laptop or computer, which provides the power for the light. Technically no power source is needed except a charged computer battery, though the light can be powered off of 4 AA batteries for fully portable use when there’s no computer handy. The light employs the use of 28 super bright white LED lights and has low, medium, and high settings to adjust the amount of light emitted as needed. The flexible gooseneck measures a little over a foot long, providing just the right amount of light to illuminate a keyboard, book, or desktop documents. The sturdy plastic clamp has rubber grip tips and affixes to most desks and tables and detaches with ease for portability. 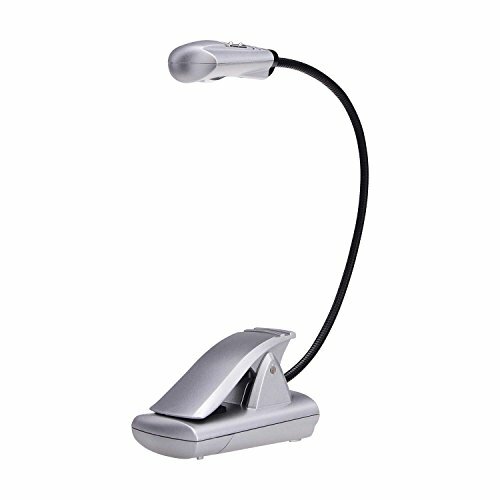 The Fulcrum Multi-Flex LED Task Light/Book Light is small, discreet, and totally portable. It’s a hands-free lamp with a flexible neck and sturdy clamp that clips directly onto a book, laptop, or tabletop to give you personal, glare-free, energy-efficient illumination whether at home or on the go. The light is powered by 3 AAA batteries (not included) and uses 3 LED bulbs that emit a wide range of light for such a small light. The LED bulbs are energy-efficient, emit very little heat, and never need replacement. The base of the light measures 1.5 x 2.5-inches and the gooseneck is 12-inches in length. The Fulcrum light’s sturdy clamp also stands on its own as a stable base, allowing the lamp to stand upright on a stable surface for increased versatility. Great for late night reading without disturbing your partner, campsites, cooking, computer use, and more, the Fulcrum Multi-Flex LED Task Light is a handy tool that you’re bound to find yourself using over and over.